Masflex Kitchen Pro Culinary Knife Collection – What Every Kitchen In Every Home Should Have. A knife is a must-have element in every kitchen, but a dull one has no place in it. Everyone should know that a quality knife is a real home must-have item. This is why the Masflex KitchenPro Culinary Knife Collection, with a total of 8 essential knives, each with a different function depending on the type of food, was introduced to the media recently. 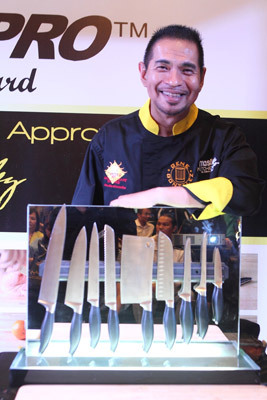 The company introduced the collection in perfect style by having its brand ambassador, iconic Filipino culinary figure non pareil, Chef Gene Gonzalez, talk about the knives’ superior qualities and features. Everything during the launch event was truly sharp. It started with the flash mob presentation followed by the product AVPs and the powerful speeches from Hiren Mirchandani, Marketing Manager for Masflex KitchenPro, who talked about their vision for the collection. Of course the launch included Chef Gene’s incomparable knife skills training where he showcased each of the knives in the collection & a cooking demo of mouth-watering dishes only this culinary master can cook up. 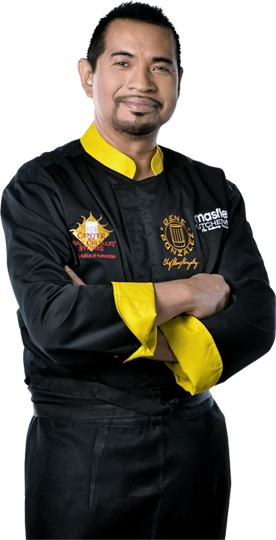 In fact, the biggest highlight of the event was Chef Gene showcasing the Masflex KitchenPro’s ultimate sharpness as he performed an “app”-like stunt, just like the popular “Fruit Ninja” game app found in many of today’s tablet PCs, smartphones and other hand-held devices. Everyone waited with bated breath as Chef Gene skilfully used one of the knives in the collection in slicing a watermelon in mid-air, which drew ooh’s and aahh’s from the excited crowd, mostly media people, important guests, and other VIPs. Overall, the event was truly fun-filled and delicious with Chef Gene’s delectable dishes and the masterfully crafted Masflex KitchenPro Knife Collection, the true star of the show amid the presence of VIP guests and even celebrities who graced the event. Some of the celebrities who were present were TV host/model Rovilson Fernandez, Janice de Belen with son Chef Luigi Muhlach, and Chef China Cojuangco, both accomplished chefs and lovers of food themselves. To end the launch, one lucky member of the media went home smiling after winning the major raffle prize for the day, the entire Masflex KitchenPro Culinary Knife Collection itself. “I really enjoy this partnership that synergized the qualities of two outstanding brands in order to create a knife designed for Filipinos, with the same quality as that of European-made ones when it comes to durability and ease of use. We hope every home will have this collection,” Chef Gene pointed out. The Masflex KitchenPro Culinary Knife Collection is a combination of two brands, Masflex, which has been in the industry for over 20 years, and Chef Gene’s brand, KitchenPro. The collection consists of a Paring Knife, Boning Knife, Fillet Knife, Cleaver, Santoku Knife, Serrated Knife, Slicing Knife, and Chef’s Knife. Each knife was subjected to a meticulous two-year development process to ensure that the functionality of each knife is at its finest. Other items in the collection include 3 types of Kitchen Shears; Basic, Multipurpose and 5-in-1, plus a 14-inch Honing Steel, which is the longest honing steel available, and Knife Accessories such as Knife Guards to protect the knife blades, the Wall Mounted Magnetic Knife Holders for easy storage, and a Hand Washing System to eliminate hard-to-remove strong odors from the hands, fingers and nails due to handling, cutting and chopping of all types of food. For more information about the collection, visit www.kitchenpro.com.ph and facebook.com/ChefGeneKitchenPro, or you can watch Chef Gene’s instructional knife skills videos on youtube.com/ChefGeneKitchenPro.